African violets can be propagated from seeds, leaf cuttings or blossom stems. 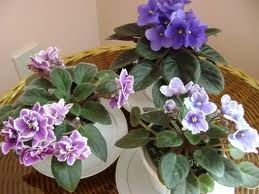 Some African violets, such as chimeras, do not produce plants that bloom true to description if you propagate them from leaf cuttings. When you propagate African violets from seeds, you never know what you are going to get because plants grown from seeds rarely have the characteristics of their parents. Remove the open flowers from the blossom stems before they begin to fade. This keeps the blossom stems fresh so you can successfully root them. Carefully cut just below the bloom and above the next pedicle to remove the flower. The pedicle is the joint from which the next bloom would appear. Cut the blossom stem off of the African violet plant just above the leaflet. Each blossom stem has a leaflet on both sides of the stem just below the lowest pedicle. This is where you want to cut it off of the plant for propagation. Trim the bottom of the blossom stem off after it has been cut from the plant so that you have approximately 1/4 inch of stem below the leaflet. Then carefully cut off any growth from the sides of the blossom stem. Fill a small pot with porous rooting mix that contains at least 50 percent vermiculite or perlite. Water the rooting mix so it is wet, but not saturated. Poke a small hole in the rooting mix for each blossom stem that you wish to root. This makes it easier to insert the blossom stems into the mix without damaging them. It is alright to put six to eight blossom stems into each 2 1/2 inch pot. Insert the blossom stems into the holes fully so that the leaflets sit on the top of the soil. Carefully push the soil around each stem so they sit firmly. Transplant the individual African violet plants into their own pots after they have started to grow.